Today when Adventure Man called at lunch, I was telling him I bought some bling for fun gifts. He said he didn’t think my family did “bling” and I said we didn’t, but this was just a little glitz, just for fun. “What’s the difference between ‘glitz’ and ‘bling?’ he asked. I said ‘glitz’ is like a little decoration, a little frosting, but ‘bling’ is ostentatious. “I consider myself ‘flamboyant.’ he said. Then it nagged at me until I had to go look it up. As it turns out, bling MIGHT be expensive, but it has the origination of new riches that the owner is afraid he might lose, so he turns it into jewelry that he can keep close to his person, as well as showy and ostentatious. So, I was wrong. As it turns out, all the following words have a connotation of excessiveness, ostentation and a little over the top. Ostentatious showiness; flashiness: “a garish barrage of show-biz glitz” Peter G. Davis. To invest with an ostentatiously showy quality: “have started to glitz up their shows with filmed backdrops” Bill Barol. “Bling-bling” (usually shortened to simply “bling”) is a hip hop slang term which refers to expensive jewelry and other accoutrements, and also to an entire lifestyle built around excess spending and ostentation. In its essence, the term refers to the exterior manifestation of one’s interior state of character, normally displayed through various forms of visual stimuli. The first apparent use of the term ‘bling bling’ in mainstream culture was in reference to the L-3 badge (real gold) and also a hip hop track of the same title, by rapper B.G., along with Baby Birdman, Juvenile et al , celebrating their wealth (as many of their tracks do). “Bling Bling,” released in 1998, led later in the 2000’s to the term proliferating through mainstream hip hop and eventually spilling over into popular culture as a sarcastic term used to mock the perceived vacuousness of hip hop culture. Comedians such as Ali G in the UK, exploited this for humour. Bling can also be plastic, or fake, jewelry. Many people who cannot afford, or do not wish to buy, real diamonds, gold, etc, opt for fake glass or plastic jewelry. This makes them look big, and bling-bling. In 2005, the rapper B.G. remarked that he ‘wished he’d patented the term’ so that he would have profited from its extensive use. In interviews, he has stated that the term refers to the imaginary sound that light makes when it hits a diamond. However, the term was in use for several years prior as a reference to getting rich quickly inspired by the sound made when collecting gold coins in popular Nintendo video games such as Donkey Kong and Mario Brothers and when collecting gold rings in Sega’s Sonic Hedgehog. The culture of ostentatious display of wealth was ingrained in street culture long before the 90’s, however: it is thought that wearing expensive jewelry was the one way in which young previously impoverished men, who had acquired riches through crime, could be sure of holding on to their wealth by keeping it about their person. This marks out the wearer of such jewelry as a person with ghetto roots, as it shows that the source of their wealth or their personal prejudices prevent them from investing in more stable assets such as cash in the bank or property. Hence ‘bling bling’, while widely regarded as a faddish slang phrase, has been seen by some as manifestation of a deeper socioeconomic problem in the US, trivialised by mainstream media and hip hop. For comparison, see chav. 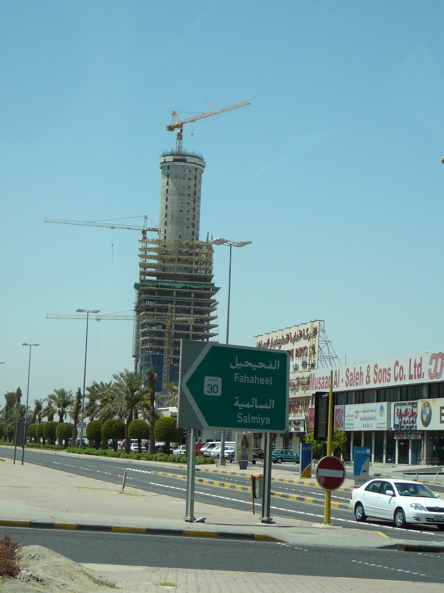 In the Middle East, counterfeit brand-name goods (such as Rolex watches) may be known as bling bling specials. 4. Given to ostentatious or audacious display. See Synonyms at showy. Glamorous; wearing fashionable clothes and make-up, particularly when done to excess. 1) She’s so glam that people think she’s a model. 2) I love David Bowie and all of those glam rockers. ‘Glam’ is short for ‘glamorous’. Glam and glamorous refer to the magical attraction and excitement produced by celebrities. There have been little articles in the Kuwait Times about this incident and similar incidents, but I don’t understand what the groups represent, and why they are opposing one another. Can anyone tell me what this is about? KUWAIT: The dean of student affairs at Kuwait University Dr. Fayez Al Kandari decided to follow up the case of the assaulted Al-Qabas photographer to the legal committee of the university, reported Al-Qabas. The committee is going to summon the member of the students coalition group who assaulted the photographer for further investigations. The committee noted that the student may face expulsion for his acts. What was the occassion of this assault? I remember in the original article there were two opposing groups of students – what was that all about? And how did Al-Qabas happen to be there? This is from today’s Kuwait Times. Does this decision by the Ministry of Education, applicable to all the private schools in Kuwait, mean that no expatriates can be hired for any administrative or assistant teacher positions in any of the private schools, only Kuwaitis? Is this a part of the Kuwaitization program? 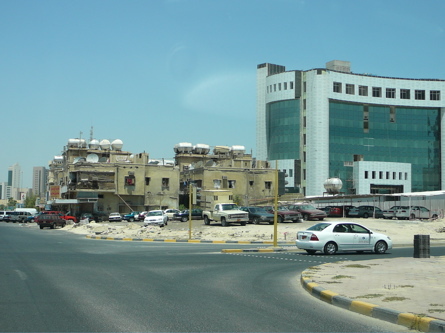 KUWAIT: The manager of the national labor ratio at the Manpower and Government Restructuring Program (MGRP) Fares Al Enezi announced the preparations for a training course to qualify national laborers to work in administrative jobs and as assistant teachers in private schools. Speaking at a press conference, Al Enezi praised the Ministry of Education’s decision on banning the hiring of expatriates in private schools as this move would help find hundreds of job opportunities for citizens. Al Enezi stressed that the MGRP was ready to provide enough qualified national substitutes and he highlited that only 410 citizens currently worked in private schoools as compared to 1617 expatriates of various nationalities. Moreover, he noted that only 140 teachers worked ther versus 10,793 expatriates who worked there as well. 13 You, my brothers, were called to be free. But do not use your freedom to indulge the sinful nature; rather, serve one another in love. 14The entire law is summed up in a single command: “Love your neighbor as yourself.” 15 If you keep on biting and devouring each other, watch out or you will be destroyed by each other. I love the way this passage describes the truly awful way the things we can say about one another can destroy. “Devour” is a very strong word, and fits perfectly with backbiting, doesn’t it? I remember one of my first Ramadans, and my friends who were explaining Ramadan to me explained how one of the most important things during Ramadan was absolutely NO BACKBITING. so I wonder if this is exactly the same in Arabic as in English. The impression I got is that backbiting in Arabic is more like gossip. Backbiting seems to imply that it is not true, but gossip can hurt even if it has a thread of truth. My impression from what my friends were telling me was that saying anything negative or unkind about another during Ramadan was severely discouraged, true or not. First it was illegal – and poisonous – additives in pet foods, then in toothpaste. Pets and people died. Now, it is illegal antibiotics in the seafood – additions that exacerbate plagues like the MRSA (methicillin-resistant Staphylococcus aureus) virus being fought in hospitals around the world, because it has become antibiotic resistant. My own father’s death was hastened by his vulnerability to this virus, and his lowered immune system couldn’t fight it off. For me, this is personal. And I think a lot of the canned shrimp, frozen shrimp and scallops we buy here in Kuwait are also from China. Who is monitoring these foods? The US has said it will halt imports of five types of farmed Chinese seafood, claiming they contain antibiotics that are not allowed in North America. The Food and Drug Administration (FDA) said it would detain shipments of catfish, basa, shrimp, dace and eel. But the FDA said it was not recalling seafood already in the US, and that drug levels were not dangerous and only slightly above detectable levels. This is the latest in a number of US warnings about Chinese products. In past weeks there have been concerns about contaminated toothpaste, dog food and the paint used in toy trains. China countered that its exports were no threat to health and “guaranteed” the safety of its products. The FDA said it had found that Chinese seafood tested between October 2006 and May 2007 was repeatedly contaminated with antimicrobial agents. Some of the substances included nitrofuran, malachite green and fluoroquinolone, which, according to the FDA, may help build up a resistance to antibiotics when used in food animals. You can read the rest of the article HERE at BBC News. Cool palm tree, huh, Sparkle? But yes, yes, it IS strangely tall. 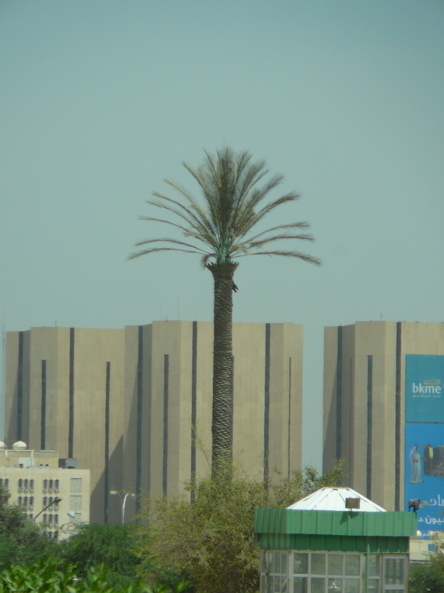 This is how they disguise communication towers in Kuwait. No! It isn’t really a palm tree, but I knew you would love the whimsey and creativity of it all. 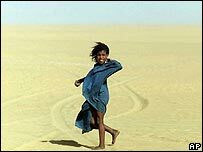 This report does not pull any punches – desertification is an environmental crisis of global proportions, it says, and one third of the Earth’s population are potential victims of its creeping effect. This is just an excerpt from an article you can read in full at BBN News. 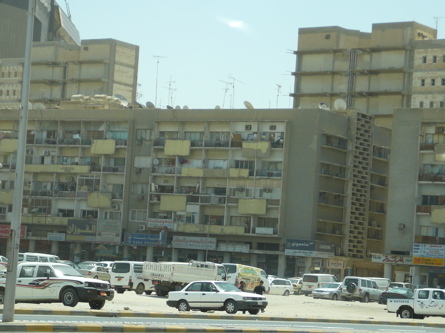 One of the earliest exploration trips I made in Kuwait was along Soor Street (Wall Street) because I wanted to see the old gates to Old Kuwait City. I could find most of them, but not all of them. 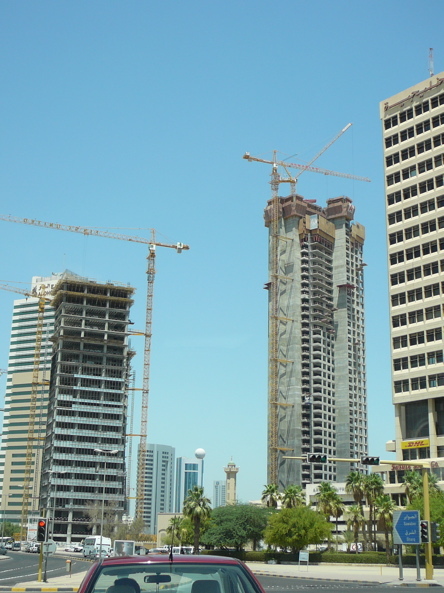 Soor Street has continued to fascinate me – and I wonder if one day soon, it won’t be all new construction. Like why even bother? These are so boring you just want to look away. The dumps on the left have about 10 men in every apartment; they hang their wash on any available fixture and shave on the balcony. I wonder how much longer these places will stand once the building on the right opens? I am guessing the owner of this prime property will also want to tear down the dumps and build something more high-rent. 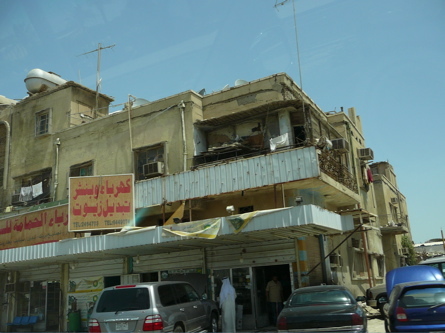 Some of you have asked for photos of some of the older places in downtown Kuwait. There isn’t much “old” but there is older. The intense heat is hard on paint and hard on maintenance, so I am guessing these buildings are only about 30 – 40 years old. This is for my Mom. 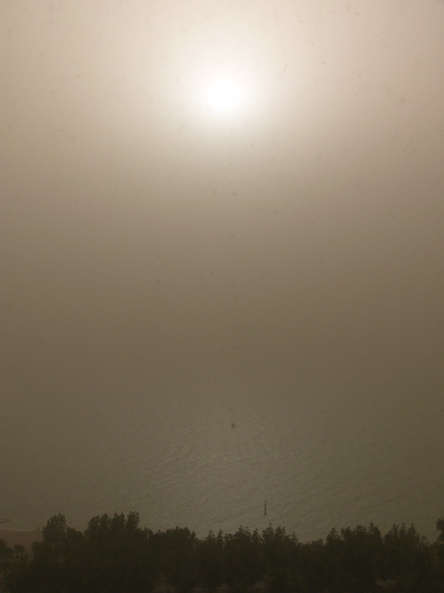 You might think it is a cloudy Pacific Northwest day, Mom, but it is already 95° F. at seven in the morning, and expected to climb to 111° F – which is the lowest expected temperature this week. The dust evidently keeps the heat down. Perhaps we have not spoken for a while. Perhaps we have never even met but somehow we have been connected through this wonderful world of email. That being said if you are considering this to be SPAM consider it the best kind because there is an opportunity here to be kind if for just a moment and truly bless someone. My name is Michael Rodgers. My fathers name is Jimmie Rodgers. Some of you might remember him from his musical career that has now spanned fifty years. In 1957 he recorded a song called “Honeycomb” and followed it up with a string of hit records totaling 25 top ten singles,eighty million records sold worldwide and concert appearances throughout the world. Through all of that he carried himself with grace, charm and an incredible sense of humor and style. In 1967 when he was 33 years old my father was injured in what is now known as a road rage incident with an off duty Los Angeles Police Officer. He suffered severe head injuries and underwent three brain surgeries. During one of those surgeries he lost 28 square inches of his skull on the right side of his head. Since 1968 he has carried what is considered to be the largest steel plate ever implanted in someone’s head. For 39 years the entire right side of his head has been entirely made of steel. It took Dad nearly 15 years to recover from the last surgery in 1968 as he had to learn to walk,speak and regain his motor skills. He was not suppose to live more than 10 years with this steel plate in his body as the body continually tries to reject these kind of implants. Over the years as he has gotten older the skin on his scalp has gotten thinner (as it does with everyone) and the steel has began to try to regain it’s original shape and the edges of the plate that overlap the remaining bone have become sharp and they continually cut his scalp open making the plate stick through the top of his head. When this happens his brain is exposed to air and possible infection, he has terrible mood swings and if left this way this situation will eventually lead to his death. Over the last 15 years he has had the plate filed, snipped, cut, and reshaped, he has had over 60 different skin graphs and other surgeries to try and keep his head from opening up. The last such surgery was 18 months ago and it nearly killed him. He now has a hole in his head the size of a half dollar and it has been this way since February. There is not enough healthy skin left on his scalp to cover it over. My dad is tough. He is the definition of the word. He has avoided what is about to take place and tried everything imaginable to live with the constant pain and discomfort and he has now made a decision that will define what will be the rest of his life. On Thursday June 28, 2007 a team of Brain Surgeons in Hot Springs Arkansas will remove the steel plate that he has carried with him for 39 years. They plan to remove the outer layer of skin and lift the plate away from the position it has held covering the outer layer of his brain. If successful they will replace the plate with a new material that has been developed that will recreate the skull bone and will not be rejected by the body. They also plan to recreate new skin on his head using his own stem cells in a paste form so that no more skin graphs will be needed. If this surgery works he will no longer have the worry that his head will open up and his brain will become exposed anymore. If this surgery works he will have the chance to live what is left of his life without pain and the ever present knowledge that at anytime his head will open up again. Dad has made the decision. The Doctors feel confident that all will be fine and we are stepping out on faith that this is the right course of action. As someone who some of you know to be a fairly private person I am opening up to you about a very serious family issue. This is not an easy time and I need your help. I kindly ask of you to give of yourselves and help me and my family and most importantly my father through the next few days. From now until the end of next week and beyond if possible I kindly ask you all to please do the following. * Please pray for my father that his surgery and recovery will be successful and that his health will be completely restored. * Please pray for the team of Doctors and Nurses that will be performing the surgery so that they might have guidance and wisdom during this time. * Please pray for our family that we might have strength and courage to face the days ahead in helping Dad with his recovery. * Please Pray whatever your heart tells you to pray to whatever higher power you feel guides your life. * Please put my father Jimmie Rodgers on your prayer lists at church or through an email request such as this one. (Feel free to copy and send). All of us are connected in this life in some way. I believe there is power in prayer and power in positive thought. I believe and claim that my father will completely recover from this surgery and that his body will be restored. I believe that together all of us through prayer and positive energy and thinking can help that to happen. Thank you for giving my request consideration. Date of Surgery: June 28, 2007 Steel Plate Removal / Skull Replacement. And my father thanks you and will be most appreciative to you for your thoughts and prayers. Please click on this link to see my father so that you can see him vital and healthy in your prayers.